Yes, loud noise in your data center causes vibration which can increase latency. Only Analytics by Sun have been able to demonstrate this in real-time. Network Management is all about Fault, Performance, and Configuration Management. Why has no one else shipped performance management software for their storage units on the par that Sun has? 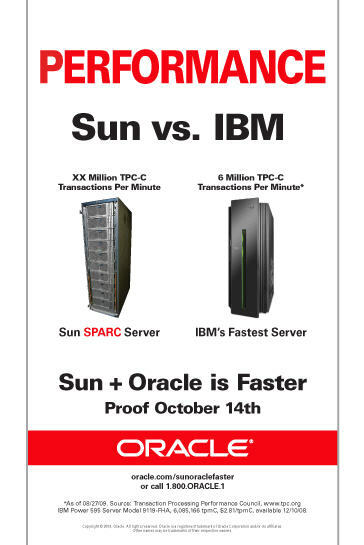 Sun Takes #1 Spot in TPC-C Benchmarks! Sun has long participated in benchmarks. Some benchmarks have been left idle by Sun for may years. Sun has released a new TPC-C benchmark, using a cluster of T2+, earlier than advertised. The Department of Justice is investigating IBM, on behalf of the CCIA. IBM also refused to license their software on computing mainframes in the past. European rack server company T3 appears to be the latest aggressor, now. Apple has been defending it's right to license their Apple Computer MacOSX software only on Apple hardware for some time. The latest upstart, Psystar (who resides in the southern part of the United States), ironically released a new line of products referred to as the "Rebel Series". What makes these cases, so very interesting, is a more recent western U.S. court ruling against software company Autodesk which is leaning in the direction that software is not licensed, but owned. As people turn to Open Source software, to reduce costs on their business, providers have been bundling their software at near-free costs with hardware, to be competitive. Now, with hardware under attack for this practice, vendors will not be able to hide the cost of software creation. If the U.S. traditionally liberal Western court is not over-turned, the computing industry is at tremendous risk. Basically, no one will pay for the salaries of good software designers and hardware designers will continually have their products knocked-off by clone manufacturers... leaving the industry in a place where innovation may suffer - because no one will reward innovation with a salary. If no one would pay for software and hardware innovation on commodity hardware, where might people go, to secure their investment? Very possibly, the next turn could be back to proprietary platforms, again. If an innovative software solution is only available on a proprietary OS which is available only on a proprietary hardware platform - there is a guaranteed return on investment... regardless of whether the software is licensed or purchased. This is not very good news, for the industry. On the other hand, this could lead the industry back to a period of Open Computing - there there was choice between hardware vendors, OS vendors, software vendors... all according to open standards and open API's that were cooperatively created between heterogeneous industry groups like: x.org, open group, posix, open firmware, etc. It is very possible that the liberal U.S. Western Federal Courts could be overturned (as happens quite often), once justices or the U.S. Congress realizes that they may be pushing a huge industry into non-existence or cause the balkanization of this industry, back into medieval fiefdoms. It could also mean the end of commercial software, if the court case is not overturned. Programmers could be turned into perpetual free-lancers, in areas where labor is expensive. In areas where labor is less expensive, programmers could be considered little more than factory workers. Hire your factory worker, by the hour, to finish your project and just release them. They will seldom see little more than a segment of code and never achieve the experience to really architect a complete solution. It could also mean the end of high quality generic open-source software. This is, perhaps, the most ironic result. If software has no value, since few will have the means to pay for it, innovative programmers may choose to leave their software closed-source, in order to survive. As much as people do not like licensing terms, the alternative is somewhat stark. ZFS is the latest in disk and hybrid storage pool technology from Sun Microsystems. Unlike competing 32 bit file systems, ZFS is a 128-bit file system, allowing for near limitless storage boundaries. ZFS is not a stagnant architecture, but a dynamic one, where changes are happening often to the open source code base. Jeff Bonwick and Bill Moore did a presentation at The Kernel Conference Australia 2009 regarding what was happening next in ZFS. A lot of the features were driven by the Fishworks team as well as Lustre clustering file system. What are the new enhancements in functionality? Disk drives often "out-right lie" to operating system when they re-order the writing of the blocks. Disk drives often "out-right lie" to operating systems when they receive a "write barrier", indicating that the write was completed, when the write was not completed. If there is a power outage in the middle of the write, even after a "write barrier" was done, the drive will often silently drop the "write commit", making the OS thinking that the writes were safe, when they were not - resulting in a pool corruption. Simplification in this area - during a scrub, go back to an earlier uber-block, and correct pool... and never over-write a recently changed transaction group, in the case of a new transaction. Pull out that old file server and replace it with a ZFS [NFS] server without any downtime. Enter an arbitrary string for a tag, issue the snapshot, issue a delete, when an "unhold" is done, the destroy is done. Makes ZFS look sort of like a relational database with transactions. If a pool is shared between two hosts, works great as long as clustering software is flawless. This was a extremely simple 80 line code segment that works well under empty pools, that was finally re-engineered for performance when the pool gets full. ZFS will now use both algorithms. Increase performance by running through the pool and metadata to ensure checksums are validated without uncompressing data in the block. From the folks in Lustre cluster storage group requested and implemented the feature. NFS benchmarking in Solaris is shown to be slower than Linux, because Linux does not guarantee a write to NFS actually makes it to disk (which violates the NFS protocol specification.) This feature allows Solaris to use a "Linux" mode, where writes are not guaranteed, to increase performance, at the expense of . Prefetch hides latency of I/O, but burns CPU. This allows prefetch to get the data without decompressing the data, until needed, to save CPU time, and also conserve kernel memory. The ZFS implementation in Solaris 10-2009 release actually has some of the ZFS features detailed in the most recent conferences.